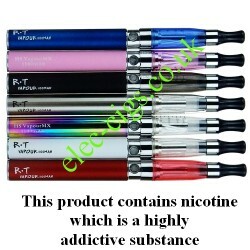 HS VapourMX & RT Vapour 1100 CE4 E-Cigarette Kit: A superb e-cigarette at a fantastic price (while stocks last). It is fully compliant with the new regulations (specification below) and it has a powerful 1100mAh battery; available in several different colours and so much longer between charging: a brilliant buy. 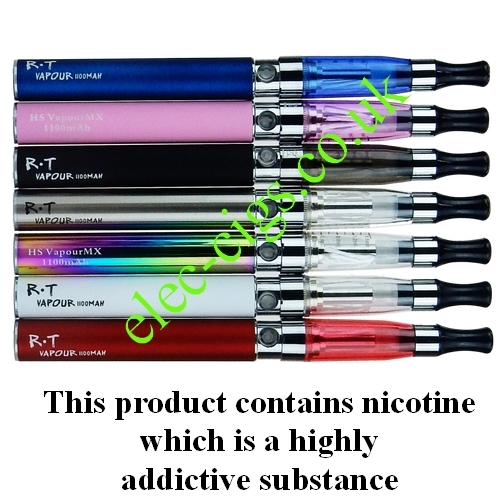 It is badged as HS or RT and you may get either brand, depending on the colour you choose but it is exactly the same e-cigarette. HS VapourMX & RT Vapour 1100 CE4 E-Cigarette Kit consists of the following: a CE4 Clearomizer with a 1.6 ml capacity; a battery of 1100 mAh; a USB charging cable; full instructions on the packaging for safe use and refilling. HS VapourMX & RT Vapour 1100 CE4 E-Cigarette Kit if used with a liquid containing nicotine then this product contains nicotine which is a highly addictive substance. This product can only be purchased by persons aged 18 years of age or older.